Young castor oil plant showing its prominent two embryonic leaves (cotyledons), that differ from the adult leaves. The dicotyledons, also known as dicots, were one of the two groups of flowering plants or angiosperms. 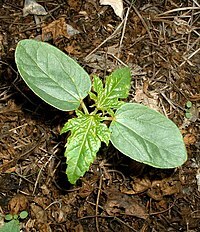 The name refers to one of the characteristics of the group, namely that the seed has two embryonic leaves or cotyledons. There are around 200,000 species in this group. The other group of flowering plants were called monocotyledons or monocots, with one cotyledon. Historically, these two groups formed the two divisions of the flowering plants. From the 1990s onwards, molecular phylogeny showed what botanists already suspected: dicotyledons are not a monophyletic group. They are a number of lineages, such as the magnoliids. Groups now known as basal angiosperms diverged earlier than the monocots did. The traditional dicots are a paraphyletic group. The largest clade of the dicotyledons are known as the eudicots. They are definitely monophyletic. They are distinguished from all other flowering plants by the structure of their pollen. Other dicotyledons and monocotyledons have an older type of pollen, whereas eudicots have derived pollen. Apart from cotyledon number, there are other differences between monocots and dicots. These are differences mainly between monocots and eudicots. Many early-diverging dicot groups have "monocot" characteristics such as scattered vascular bundles, trimerous flowers, and old-type pollen. Also, some monocots have dicot characteristics such as reticulated leaf veins. ↑ 2.0 2.1 "Monocots versus Dicots". University of California Museum of Paleontology. Retrieved 25 January 2012. This page was last changed on 23 November 2018, at 08:53.